The birth of Christianity was shaped by Roman manipulation of Jewish religious forces during the occupation of Judea in the first century CE. Navigate through the topics at the left to investigate historical references and download a free journal paper to learn more. Each topic provides information on how ancient Rome subverted Jewish resistance, inadvertently resulting in the birth of Christianity. Historical aspects, rather than traditional theological views are presented and summarized below. The birth of Christianity arose amidst the impassioned conflict between the Roman and Jewish cultures. The early Christian writings reflect obedience towards paying taxes to Rome and acceptance of tax collectors within their fold. The early Christian writings reflect submissiveness to oppression; turn the other cheek, love your enemies, blessed are the meek, the peacemakers - which portray obedience towards Roman rule and rejection of Jewish resistance. Christian teachings were significantly different from Judean culture, even critical of Judean Law and religious authority. Early Christian writings used the term Gospel in nearly identical fashion to Roman use prior to Christianity. The concept of deity in human form and being the son of a god, conceived from a virgin birth, existed in Roman culture prior to Christianity, and was a likely source for the design of the Christian movement. Many of the documented miracles (such as feeding 5,000 people in remote areas) would have required the logistics of an organization with significant funding and planning (i.e., Rome). The Jewish people endured oppression during the Roman occupation. The Jewish culture engrained centuries of rejection of outside influences and/or alterations to their religious doctrine. Jesus' teachings differed radically from the traditional Jewish culture. Jesus was very critical of Jewish religious authority and those who maintained and taught the books of the Jewish religion. His criticism was well in line with Roman goals to undermine Jewish resistance to their rule. The Jewish people and a Jewish court condemned Jesus to death, not Roman authority. Jesus is never documented as being critical of Roman authority. In the Gospels, Roman authority is never documented as being critical of Jesus. 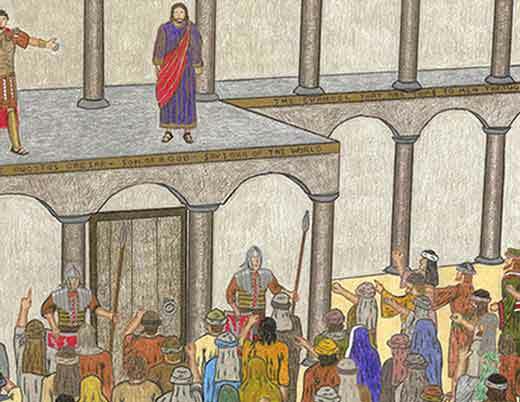 The Roman governor, Pontius Pilate, argued profusely in defense of what was supposedly a Jewish peasant (Jesus) in an open public forum in front of an angry Jewish mob. Jesus survived (i.e. appeared live afterward) a Roman "execution," which strongly suggests Roman involvement. Jesus spent relatively little time on the cross (6 hours) in contrast to typical crucifixion victims who spent many agonizing days before death. The written accounts of the crucifixion mention nothing about nails being used. In the earliest Christian writings (the first three Gospels) no form of physical violence occurred to Jesus while he was on the cross. Much later writings (the Gospel of John) describe physical violence (illogical violence) not recorded in the earlier writings. Roman soldiers stood guard at Jesus' tomb. One of the only written accounts of Jesus being referred to as the Son of God comes from a Roman centurion. Jesus referred to a centurion as having the greatest faith in all of Israel. Why did Christian philosophy spread so quickly to Rome? Is it possible that Christianity had its basis in Roman ideals rather than Judean philosophy? A primary source of the fervent Jewish resistance to the Roman occupation was the Jewish religion and their Holy Covenant with God. Was Christianity born of human conflict between the imperialism of the Roman Empire and the self-perceived entitlement of the ancient Jewish culture? Is Christianity a result of Roman attempts at manipulation of religious forces in Judea? Navigate through the topics at the left to learn more.